The beginning of the 80s was marked by a crisis in the industry. Hundreds of workshops closed and thousands of workers left the industry. Diamond companies were stuck with large stocks of diamonds. The crisis brought about a structural change in the diamond industry: large polishing factories were closed, and the majority of the factories and workshops employed no more than 30 workers. In 1980, a bridge between the Maccabi and Shimshon buildings was built, so that all vital services for bourse members were brought under the same roof. In 1982, constrictions on the import of polished diamonds to Israel were lifted. This change in policy aimed to increase the variety of diamonds Israeli diamantaires could sell, including diamonds not manufactured in Israel. In 1985, women joined the Israel Diamond Exchange as equal members. The Israeli diamond industry hosted the 23rd International Congress of Diamantaires, and inaugurated the Harry Oppenheimer Diamond Museum. 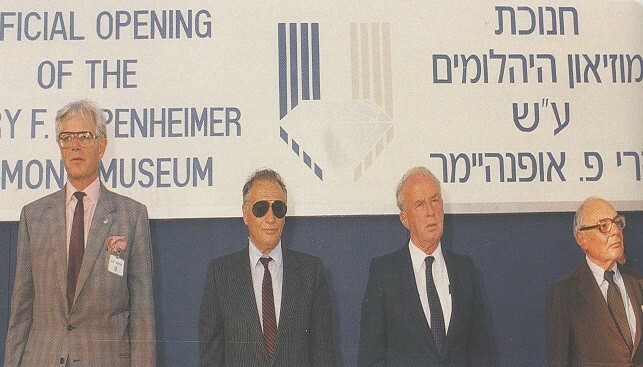 In 1986, the Harry Oppenheimer Diamond Museum was inaugurated, showcasing the Israeli diamond industry. The Museum was named after Harry Oppenheimer, then owner of De Beers, who attended the inauguration ceremony. In 1987, Israeli exports of polished diamonds exceeded the $2 billion mark. In 1998, the cutting machine CM1 was developed. It introduced laser splitting, and gradually replaced the traditional method of manual splitting.